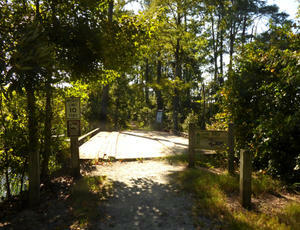 Trail head for hikers, Alligator River National Wildlife Refuge. Now that the summer season is over and fall is upon us, there are new traditions that become a part of lure of the Outer Banks. There are still a lot of reasons to visit-in fact, autumn has become a true second season-but with traffic easing back a bit and the weather wonderful, there are some opportunities to take some day trips and discover a different side of coastal North Carolina. The north end of Hatteras Island is Pea Island National Wildlife Refuge-a place of exquisite beauty that offers something for everyone. The visitor’s center is a great place to start. Located about 3.5 miles south of the Bonner Bridge, the center includes maps, information and restroom facilities. There is an easy trek around an impoundment-take your camera, especially in the fall. Pea Island is a world renowned birdwatching area. For kayakers there is a put in at New Inlet. At the southern end of the refuge, just before Rodanthe, are the S Curves–a stretch of road perilously close to the beach–and a beach that is famous for the power and shape of its waves. Surfers–stop and check this out. One of the largest national wildlife refuges on the East Coast, Alligator River National Wildlife Refuge is huge-about 152,000 acres. Located on mainland Dare County, there are a number of areas to kayak and Outer Banks tour operators offer a variety of options. There are a lot of well-maintained hiking trails, most very easily navigated. Bear, fox, raccoon, and yes, alligators are common. Bird watching is also popular on Refuge grounds. Located on Knotts Island getting to Mackay Island is its own adventure. Knotts Island is a somewhat isolated but pleasant residential and farming community on an island in the northern corner of Currituck Sound. Access is either through a road from Virginia that crosses the swamp and marsh on the north end of the island or a very pleasant-and free-45 minute ferry ride from the village of Currituck on the mainland. Take the ferry . . .
Abundant wildlife is everywhere at the refuge, but what it is truly known for are the 100s or thousands of migratory waterfowl that flock to it’s waters in the fall. Helpful hint: there are no restaurants and only one convenience store on Knotts Island. Pack a picnic lunch.